NWS forecast pretty much the same as last night.Same 6 to 10 for my area but they mentioned backside looks like less.They still mention last minute shifts can influence precip types and amounts.I'm thinking at this juncture the all snow area will remain well N and W of the LHV and we get snow/sleet mostly here.NWS has snow chances Tues-Weds as well. NWS changed my watch to a warning. Calling for a general 12-20" across the region, but with the experimental forecast they're saying min of 11", expect 17" and a 40% chance of 18-22". Jimmy you make my laugh. Hold out hope for a southern jump, it’s not over till it’s over. If the models were all right, all the time, we wouldn’t have this board for weather discussion. Scullybutcher wrote: Jimmy you make my laugh. Hold out hope for a southern jump, it’s not over till it’s over. I’m glad it makes you laugh. That’s a positive. I’m apoplectic to be honest. Am I the only person on the board that would love to see Syo as a guest weatherman on TV? Verbatim the 6z gfs and NAM both have me getting about 2 or 3” of snow. Gfs has several hours of heavy rain sandwiched by a couple hours snow at the front and back. 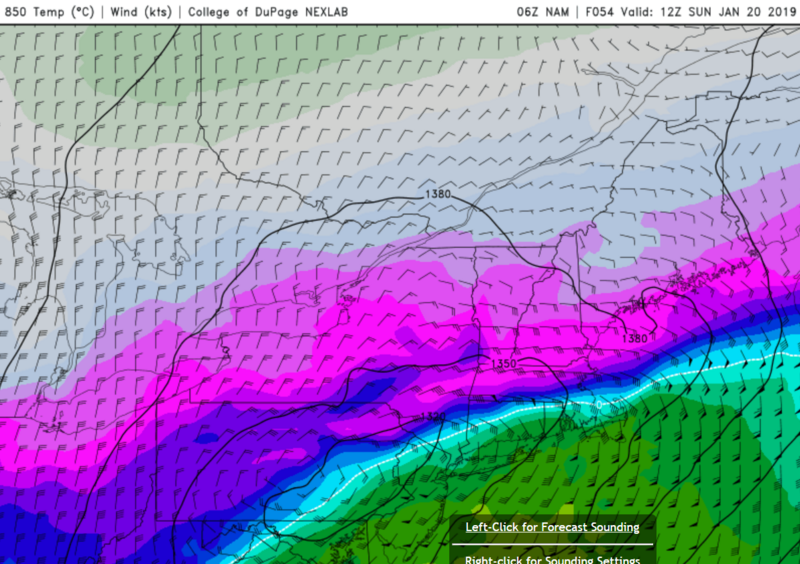 NAM has the snow with mix, sleet and about .25” freezing rain in between. I’m sure somebody will tell me the 6z gfs looks slightly better in some way than the last run (because I’ve heard that a lot the last few days) but from my perspective it’s been - at least for most of NJ - pretty consistent on this for a few days now. The NAM has also been pretty consistent staying a little colder and with more frz rain/sleet in the middle of the storm for Central/North Jersey. 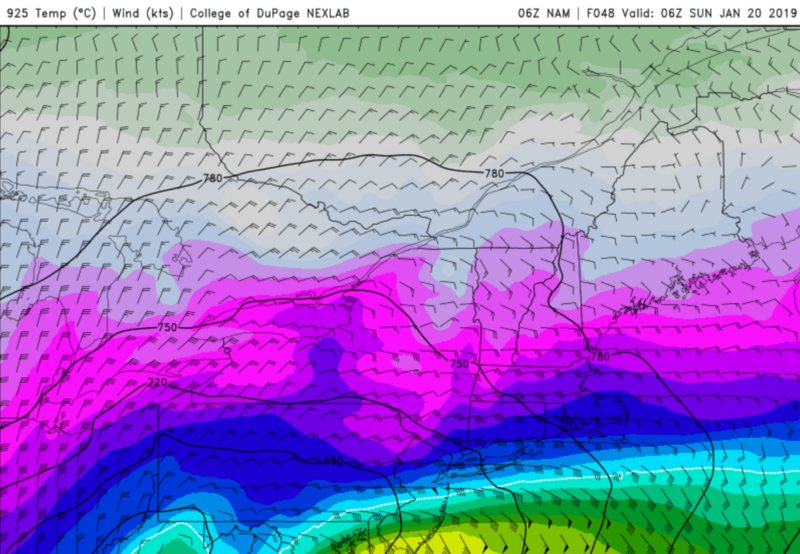 To me that’s the battle in most of Central/North NJ and NYC proper: Is the GFS right that the warm air overtakes at the surface making the middle of the storm a rain event; or, is the NAM right that the surface cold air remains entrenched as the upper levels warm giving us prolonged sleet and freezing rain in the middle of the storm. I think under either scenario the snow is minimal on the front/back ends. (By minimal I mean only a few inches before a changeover to something). Syo u know nws never goes all put first map lets see what happens. It does look like long island is go be difficult though. I love the map no snow for nj strong lol. On another note its white out. Albeit like 1 inch but at least it feels like winter. And I should add, I don’t think we’ll know for sure whether the warm or cold air wins the battle at the surface until it’s happening Saturday night. I’ll likely be sleeping because a fight between sleet, freezing rain and rain is one I don’t buy tickets to unless it’s on inthe daytime. Lol. billg315 wrote: Verbatim the 6z gfs and NAM both have me getting about 2 or 3” of snow. Gfs has several hours of heavy rain sandwiched by a couple hours snow at the front and back. 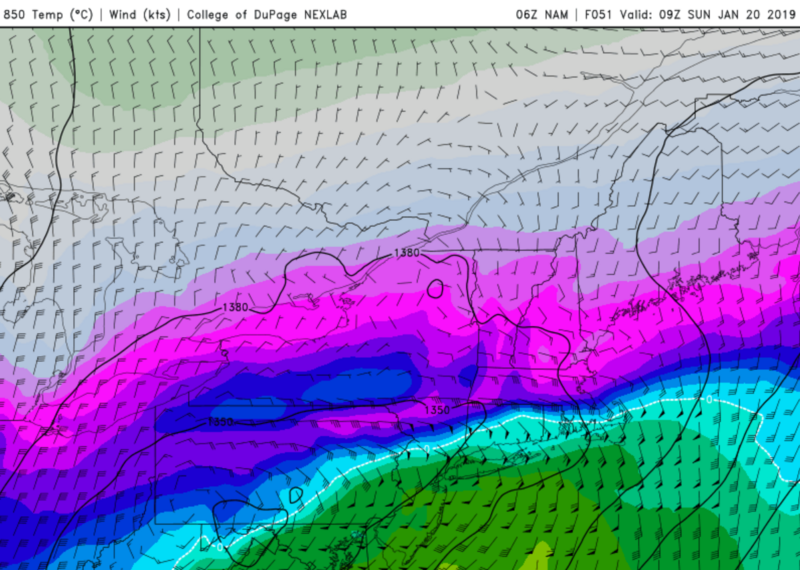 NAM has the snow with mix, sleet and about .25” freezing rain in between. Personally? The Euro seems to have been less focused. It’s jumped around a bit more. And I’ve cooled on it overall the last year or so. TheAresian wrote: Am I the only person on the board that would love to see Syo as a guest weatherman on TV? Only if it was on cable! The trends vernight by the modles showing teh CAD and yes that word again the CAD (Cold Air Daming) fighting off the warm mi dlayers is interesting to see and we'll know much more as our storm is over land for ballon and other smaplings. This will enhance teh model forecasts. NAM suite and HI RES model are going to see the CAD sig and that my friends is where the fight will be. GFS and its brother FV3 please thEy are lost - euro is ALL OVER THE PLACE! Ukie and Icon as well as Deep Thunder have been steadfast overall which is interesting. The word for the storm is C........A..................D.......!!!!!!!!!! Please today keep it on the model runs not IMBY or Biaging about things - do that in Banter please. I'm very excited, but I see everybody else hoping they get a few inches out of this and it's a little rough. I might know less about weather than anybody on this board and to see all of the work that people put into analyzing only to come out of it with slush also gives perspective. Folks you can believe this or not. This system is so intricate that the king euro will not pin point exact details and even the short range high res models wont either. There will be surprise's for better or worse. Areas that are on the boarderk of the crap and the gold is where we see it. These last minute toggles in extremely dynamic/fluid system like this wont be known until it happening. The models ALWAYS have a difff time with this. A geographic area of no more than 20-40 miles could go from 1-3" of s crap to 6-10" of awesome in a blink of an eye with how hard its going to thump. This thread will cont to be for analysis and discussion only. Any excessive whining, moaning, crying, pouting, feet stomping, rolling on the floor will be immediately deleted without warning. We are all adults here. The weather will do what it wants. There is a play pen to post the non sense. The storm hasn't even happened yet. I m going on record as saying my back yard will get 3-6" of front end snow and sleet before the changeover. IDK guys, for the pros on the board, it seems like no model has been able to really get a handle on this storm. Why do you think that's the case. emokid51783 wrote: IDK guys, for the pros on the board, it seems like no model has been able to really get a handle on this storm. Why do you think that's the case. There are MANY moving parts at many levels of the atmosphere that are changing rapidly and fluidly as the moving parts come together from the N S E & W. With such dynamically moving parts its hard for models to keep up with the changes when spitting out their forecast. sroc4 wrote: Folks you can believe this or not. This system is so intricate that the king euro will not pin point exact details and even the short range high res models wont either. There will be surprise's for better or worse. Areas that are on the boarderk of the crap and the gold is where we see it. These last minute toggles in extremely dynamic/fluid system like this wont be known until it happening. The models ALWAYS have a difff time with this. A geographic area of no more than 20-40 miles could go from 1-3" of s crap to 6-10" of awesome in a blink of an eye with how hard its going to thump. Thanks SROC! I will say that over the past few years I have leaned more on the NAM as we got closer to game time. Would just be nice to get either snow or an ice storm here in Deer Park! The 06z NAM shows snow beginning between 5-6pm Saturday and lasting until 9-10pm before it tries to changeover to either a wintry mix or rain. Here is a look at some temperatures on frames when the changeover tries to occur and precip is coming down quite heavily. 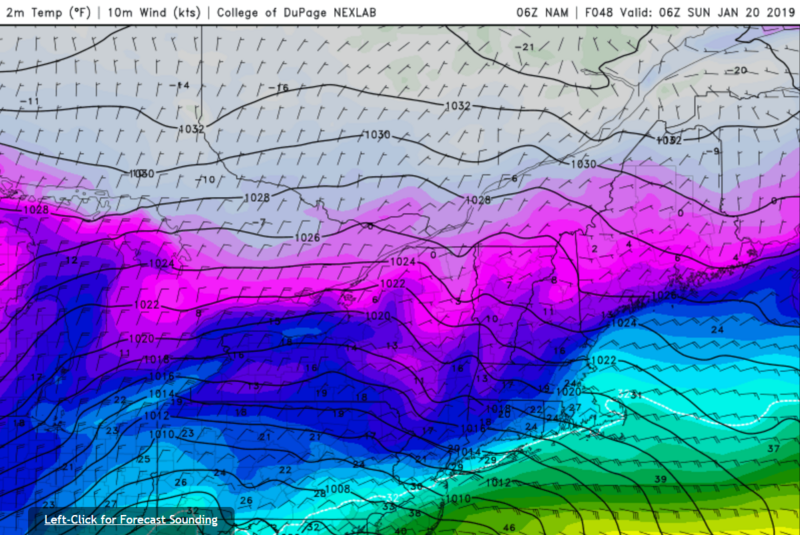 With marginal surface temps and 850mb temps above freezing - central NJ has changed over from snow to sleet/mix. NYC and the south shore of LI are literally on the line. Most likely, these areas are still all snow but its only a matter of time, maybe 1am, when the changeover occurs. Everyone else is all snow. 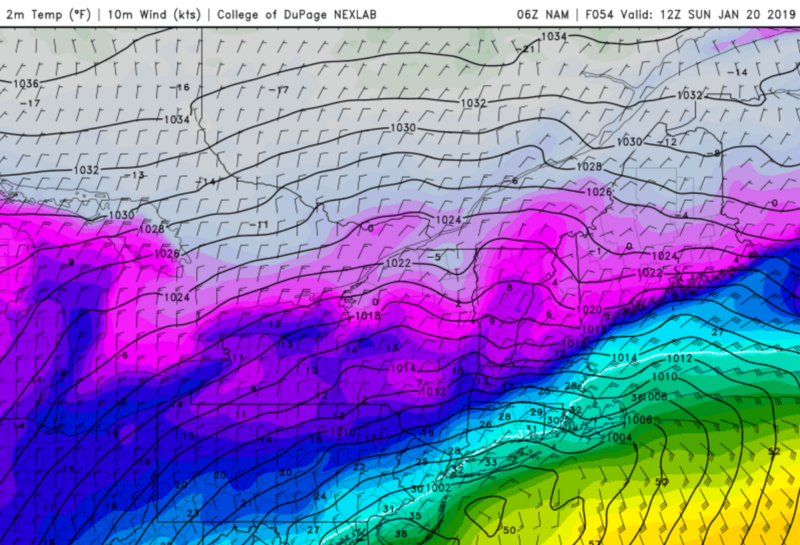 At this point 850mb temps have warmed considerably for the entire area. Far NW NJ, SW NY, and NEPA are the only places that are snowing at this point in time. 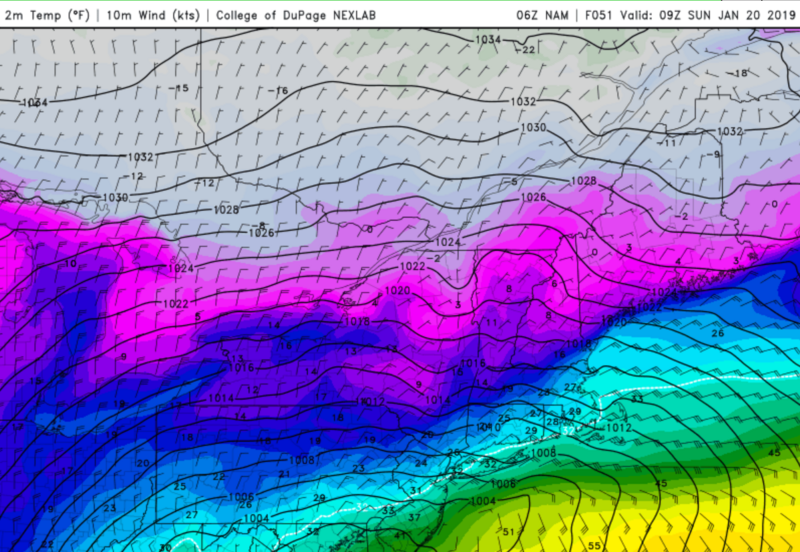 I think the call out here is the places where surface temps are in the mid-20's, 850's are above freezing, and 925mb is below freezing, you are susceptible to ice accretion. This would be NNJ (away from NYC), SNY and much of CT. Much of eastern/southern NJ, NYC, and LI are a very cold rain at this point on the NAM. Not a whole lot changes between 3am and 6am. 925mb warming even further might be the biggest one. If you take this run of the NAM verbatim it has definitely trended snowier for those well N&W of NYC and reintroduces ice back into the picture for parts of the Metro area, likely JUST N&W of NYC. The areas I outlined above. 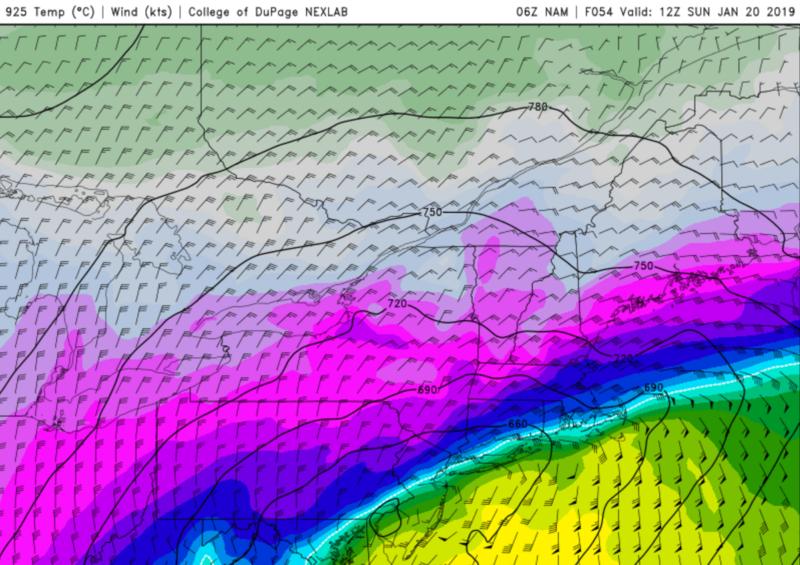 If there is a continued shift S&E the ice/snow threat could become an issue for NYC and areas near the coast. Right now, this is actually one of the coldest models as others are much warmer. But I'm just trying to highlight the impact if this came to fruition. NEPA, NW NJ, SWNY - areas who stay all snow - saw over 12 inches of snow verbatim this run. The NWS, most, but not all models (looking at you here ICON), Accuweather and just about every other forecaster/meterologist/hobbyist/enthusiast has this area for 12-18". The Weather Channel, which carries the WSW saying 12-20", is calling for 8-12". There's always that one that has to be different. Frank_Wx wrote: The 06z NAM shows snow beginning between 5-6pm Saturday and lasting until 9-10pm before it tries to changeover to either a wintry mix or rain. Here is a look at some temperatures on frames when the changeover tries to occur and precip is coming down quite heavily. In a couple of places here you reference SWNY (southwest NY) where I think you mean SENY (southeast NY). Our only member in SWNY that I know of is the Aresian. Mt Holly finally issued wsw for upper bucks and western Montgomery counties. Really not sure what they were waiting for. Calling for 6-8 snow and then .2 of ice accretion. Lovely. .2 is not severe anything .4 and above you gotta start to worry. Unless the ice encased a lot of snow accumulated on trees. Now roads will be treacherous. Euro 12z is north quite a bit compared to the 6z. The 850 temps are above freezing for the southern half of NJ by Saturday night.